One of our first and continues to be one of our very favorite med-staff at check-in. Our youngest daughter was diagnosed in 2006 at age 3. Just two years later at age 5, with an already strong commitment to leading the best possible life despite T1d, I bravely packed her up for a day camp experience. She was so tiny that while it seemed impossible to actually leave her on the campgrounds, her wide smile proved that we were doing EXACTLY what needed to happen. Our youngest daughter felt no fear, worry or concern about having her very first camp adventure. Even more importantly, she wasn't even thinking about type 1 diabetes, she was only focused on being a kid. At that same moment, I was also dropping off our oldest daughter, who was seven at the time, to the same camp. 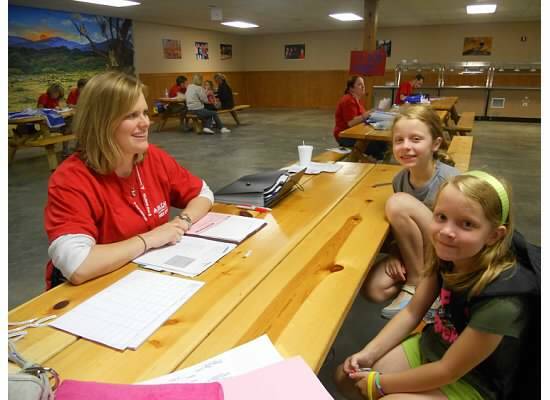 In a different section of the camp, day campers were allowed to attend without a T1d diagnosis during the same week. It was wonderful for a different reason; both daughters were sharing the same experience, at the same time, without an emphasis on missing out because of NOT having T1d. It was equally as critical to provide our oldest daughter with the feeling that she could also focus on just being a kid and not taking a non- T1d sibling backseat either. Two awesome counselors at daycamp, year two. The first week wasn't perfect, I struggled with letting go and found myself parked too long after dropping off and arriving too early at pick-up at the end of the day. It wasn't for a lack of trust with the fantastic camp counselors or the med staff, but a reflection of my struggles to let others care for the girls. It had been 'us' for so long, with little outside help, that I found it hard to suddenly turn my caregiver side off for a week. Just as I started to let go and feel the benefits of relaxing my grip, the week ended. However, having that first year under my belt, certified my commitment and desire to try it again the next year. As hard as it was for me as a mom, the girls thrived and created new friendships that have continued through their childhood. The biggest take-a-way was the realization that others were sharing our journey and we didn't need to go at it alone. Oldest daughter's first year at overnight camp. The following year, a second diagnosis invaded our family. In the odd way things happen, when camp time rolled back around, there was no discussion of IF our girls would go, but WHEN they would attend. Our oldest daughter was old enough to make the choice of staying in day camp or head to overnight. Without hesitation, she asked to stay overnight. With only a few months of an official diagnosis of T1d, our oldest bravely ventured away from the comfort of sleeping in her own bed, for a week of sleepovers with her many new friends. That left me with the task of continuing to drive back and forth for our youngest daughter at day camp. Part of me felt relief with the thought that if oldest daughter needed my assistance, I would be able to help - at least at the start of every morning and every evening. The other part of me felt an underlying unease at the thought that I might overshadow her first real camp experience. Swimming in the big lake. The next year was one again of a day camp experience for youngest and for oldest, another overnight. Things proceeded more peacefully as there was no way that I wanted to inadvertently step into an emotional beehive due to spying! Camp Midicha group pic of 8 and 9 year-olds in 2011. By year four, our two girls prepared for a joint overnight experience. While they are two years apart, the reality was that age group of cabins would never allow them to bunk together. They are truly best friends and both struggled with the idea that could spend a week together but also apart. We explained that they would see each other frequently at the cafeteria, the lake and even the big bonfire at the end of the day. At the end of the week for pick-up, their med staff volunteer rushed up to me with a big hug and said she was delighted to have the girls at camp. She explained that they were so kind to each other that when one needed an infusion site and felt scared, she immediately asked for her sibling. The sibling arrived, held her sister's hand and comforted her extensively. At that moment, it occurred to me that it was the first time the girls had experienced total independence without mom. I knew that I could start to let go even a bit more. The girls had each other. She has always been a top-bunk kind of girl. Looking back at that story now, I am not even sure which daughter needed the comforting. When I asked the girls, they both pointed at each other and swear that they were the ones who did the comforting. That's the result of the independence that we have going into year seven. Both feel empowered by their T1d. Even though she was little, youngest daughter flourished at her first few camp experiences. Camp has become an extension of our family. Without even noticing the subtle joyful effects of the friendships made by the many organizers, med staff, counselors, counselors-in-training (CITs), and fellow campers, there has been an undeniable footprint of independence, love and compassion on all of us. It has fostered long-term goals as both of my girls strive to become CITs and eventually, counselors when they graduate high school. The reason? They both explained that they want to show the little kids the same kindness that they were extended. Oldest daughter with her most cool shades! As my youngest daughter said, "The first day you dropped me off at camp was so scary. Then, I remember seeing a kid with a pump that was black but looked like mine. I knew I was in the right place. Then, the counselor came over and let me wear her hat. She was so nice and helped me not to be scared. I really liked her and she had diabetes too. It was like all of us just belonged together. I liked that feeling." Thank you to ADA Camp Midicha for seven wonderful years. Together, we are raising some wonderful kids that just happen to have T1d. Thanks for being part of our family. We love camp too! Our daughter is on her 5th or 6th year of camp. :) She's been at 3 different camps and likes each of them for different reasons. I've said it before, it's hard to know whether to stay home close to the phone (sort of), close to camp, or do something as a family that's hard with a diabetic (Cinnabon anyone??)! Camp is great and I never get tired of seeing other families enjoying the same multitude of benefits. I only wish it were 2x per year.